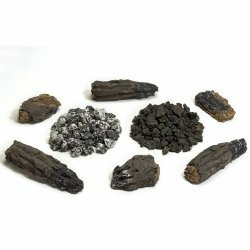 The traditional ember bed kit includes six burnt log pieces, white ash, and lava rock. "Nice product, but didn't need it"
Review: I purchased this with the 18" Sassafras log set. We have a small fireplace box and had enough accessories that came with the fireplace kit that I returned this. If you have a larger fireplace box, then you'll need this.